New Utah Gardener: If You Garden, You Need This . . . If You Garden, You Need This . . .
Ok. There are seed catalogues and more seed catalogues. But this seed catalogue is a work of art. It's arrival in the winter mailbox is an event. It is a dense book of ideas, imagery, color and information that keep hopes and dreams alive through the dark and cold days of winter. 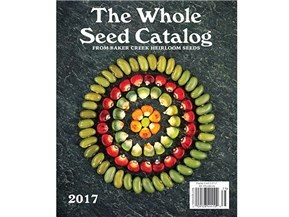 Loaded with inspiring photos and write-ups about the many heirloom fruit, vegetable, herb and flower seeds that they sell, The Whole Seed Catalogue From Baker Creek Heirloom Seeds is well worth the $9.95 price (they also offer a free catalogue, but it's different from this one. Get this one.) . This is a must have for all gardeners - an excellent gift! Thanks Katy. Purchased for Diana.